The combination of learning German and one of the most popular hobbies, playing football, offers students particular motivation in the subjects of German and PE. That’s why it was used as the central theme for the Mit Deutsch zum Titel! (Become a champion with German!) project, which was implemented in the run-up to the FIFA World Cup. The project, which is organised by the Goethe-Institut Moscow, consists of three elements designed to complement each other. The poster exhibition Ein Ball - viele Geschichten: Fußballnation Deutschland (One ball – many stories: Germany the football nation) portrays the history and current situation of football in Germany and features special additional GFL material. This allows the exhibition to function as a place for learning history and language. As part of the Goethe Cup school competition, teachers put the German and football learning programme into practice with their classes. The 13 to 14 year-old girls and boys in 6th – 7th grade learned German and practised football to prepare themselves for competition against a number of other schools from the same city in both disciplines. The points scored by each team in the final test of the German programme were added to the results of the football matches. In each city the school team that performed best overall, in other words in the German programme and the football tournament, won the Goethe Cup. Mixed-age school teams had to demonstrate their knowledge of German league football in an online competition called Bundesliga total!. The Goethe Cup learning programme was not part of the regular curriculum. This lesson format, which was introduced on a mandatory basis in Russia in 2015, is becoming increasingly important in schools. For one thing it creates a wide range of learning opportunities that reflect the actual interests and preferences of students. Also it allows teachers to try out new methods and formats, such as co-teaching by different subject teachers using the CLIL method. The combination of German and football even motivates learners who are less literate in foreign languages. | Photo: © Taissia Spektor The German and football learning programme has brought German and PE teachers together at participating schools. 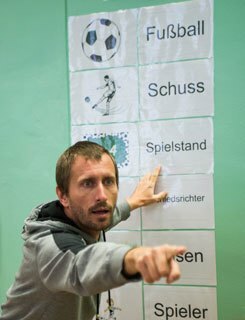 For example the project has involved students using German vocabulary during games lessons, and talking about their football training in German lessons. It wasn’t just the teachers who were responsible for transferring the learning content between the two subjects. Above all it was the students themselves who were able to bring their own experiences and new skills into both subjects, which was very much in keeping with the principles of learning process customisation and student independence. The interaction between these two subjects particularly appealed to learners who were less literate in foreign languages, allowing them to achieve success in German learning for the first time. The Deutschlandlabor investigates popular clichés about the Germans and shows a diverse image of society. Of course Nina und David are also interested in football. There are also worksheets and teacher’s notes on the video. The podcasts provide information about everything that happens in Germany, as well as on and around the football pitch. Each podcast has its own quiz. Additional lesson materials are available for teachers. 32 football nations will be battling it out to win the FIFA World Cup 2018 in Russia from 14th June onwards. PASCH students from these countries answer a variety of football-related questions. Talking about football is not that easy. These words and expressions, complete with explanations, help students to do this. From the World Cup quiz to player profiles: while the professionals are getting ready for the next game, “Deutsch für dich” offers free football-themed exercises to train up your German skills. These materials prepare students (language levels A1+ and B1+) to put on their own Sportschau-style TV or radio show. A resource pack for language levels A1 and B1, as well as educational material for extracurricular activities, was developed for the UEFA Euro 2012 in Poland. Now you can take advantage of the euphoria of the World Cup 2018 in Russia to bring football into your German lessons – and maybe German into your sports hall too. Dr. Maria Lukjantschikowa is the officer for language course cooperation and promotion of the German minority at the Goethe-Institut Moscow, as well as project leader of “Mit Deutsch zum Titel!”.